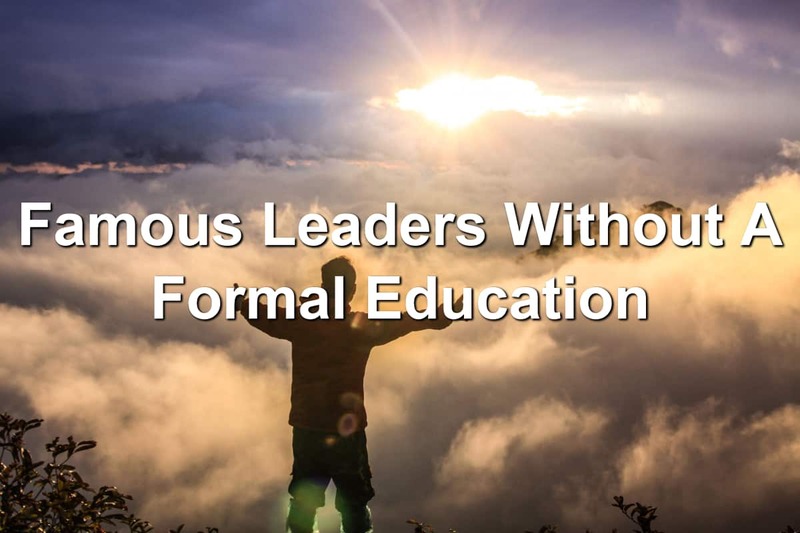 If you think your lack of education will stop you from leading, let this list be an encouragement to you. You don’t need an education to lead. What you do need is passion, wisdom, and the ability to step up when others are sitting down. Churchill is best known for his time as Prime Minister of Great Britain. He also played a major role in World War II. He helped steer Great Britain away from defeat all without a college degree. That’s right, the man who founded Wendy’s didn’t have a formal education. He left high school to work at the Hobby House Restaurant and then went on to open up his first Wendy’s. He led Wendy’s as their CEO and grew them to the fresh, never frozen beef behemoth they are today. He had studied science at Muskingum College. Yet, when Pearl Harbor was attacked by the Japanese, Glenn dropped out of college to join the fight. He became the face of NASA as the USA raced Russia to become the first to space and the moon. Glenn also played a large part in politics. With only an 8th grade education and no potential job prospects, Disney chose to forge his own path. He opened Iwerks and Disney Commerical Artists. Later, he founded The Walt Disney Company. Disney’s lack of education forced him to look at his opportunities in a new way. This allowed him to create his own company that is still delighted young and old almost 100 years later. Despite his lack of education, Ted Turner has built and led a media empire. He is the founder of CNN. His drive and passion basically created 24-hour news (whether or not that is a good thing is up for debate but he did it!). Known as one of the biggest motivational speakers around, Tony did not attend college. He chose to read and educate himself in an informal setting. This led him to writing multiple books, inspiring millions, and hosting seminars around the world. Douglas didn’t let his status as a slave to keep him from learning to read and write. He taught himself how to read and write. From there, he helped other slaves learn these valuable skills. This changed the destiny of many oppressed people. Green founded the arts and crafts store Hobby Lobby. With little more than a high school diploma, he started his business. He hasn’t looked back since as Hobby Lobby stores are all throughout the United States. Question: Do you still think your lack of education should hold you back from being an exceptional leader? Why or why not?